Invited by Edwin and Agustine to their set located in Balakong, Selangor sometime last weekend. Its a big setup by home gardener standard especially within the urban vicinity where land area is at its premium. 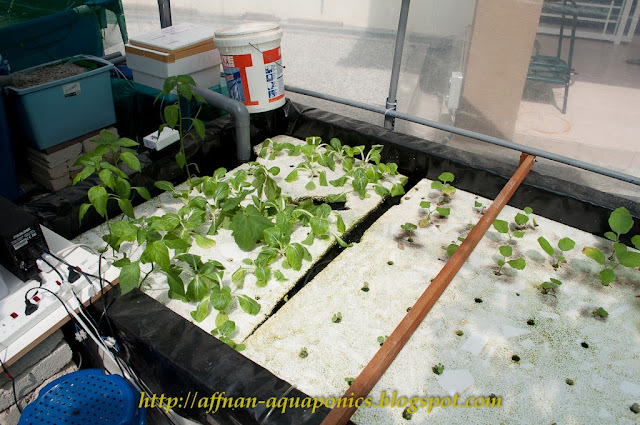 Their setup, make use of gravel grow bed Siphon Flood & Drain and Deep Water Culture using polystyrene foam raft as growing floats. 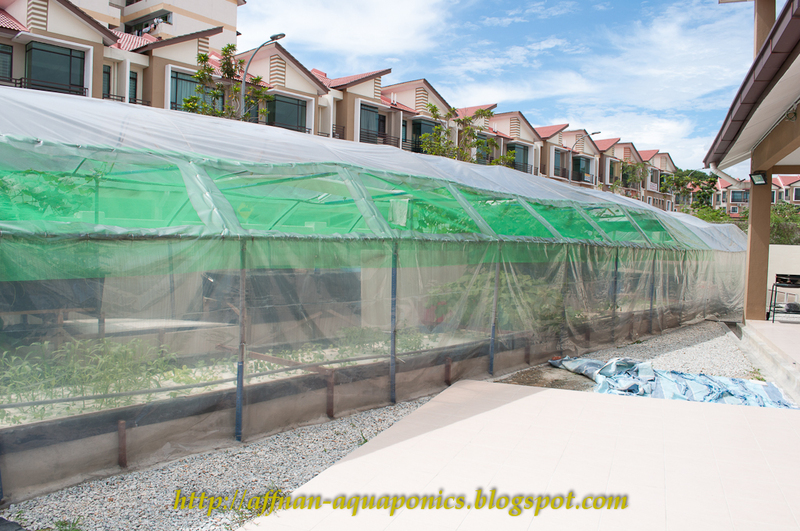 These are housed in a Polythene "Green House" to protect from bugs and the elements. DWC and the Flood and Drain sets are isolated in their water source, with a big swimming pool tank for the DWC water reservoir and fish tank, feeding DWC channels via filtration. Fish tank stock with Tilapia, Green Kelah and few other fish. Various filter used to get fish solids out from water before irrigating the DWC channels and water are returned from the extreme end with a pump to complete the cycle. Flood and Drain in the opposite side on the other hand utilizing growbed over the fish tank approach. 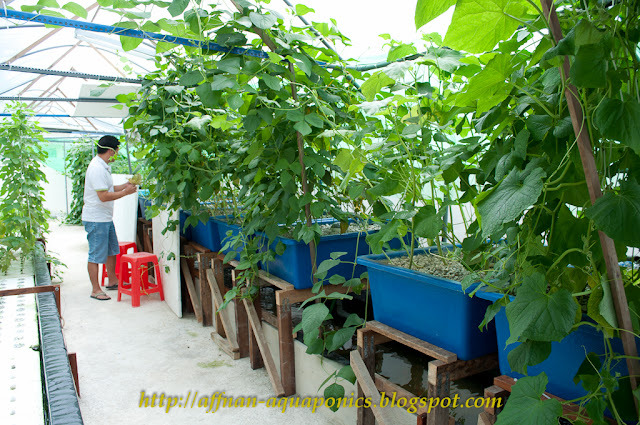 This is the simplest way to do Aquaponics. 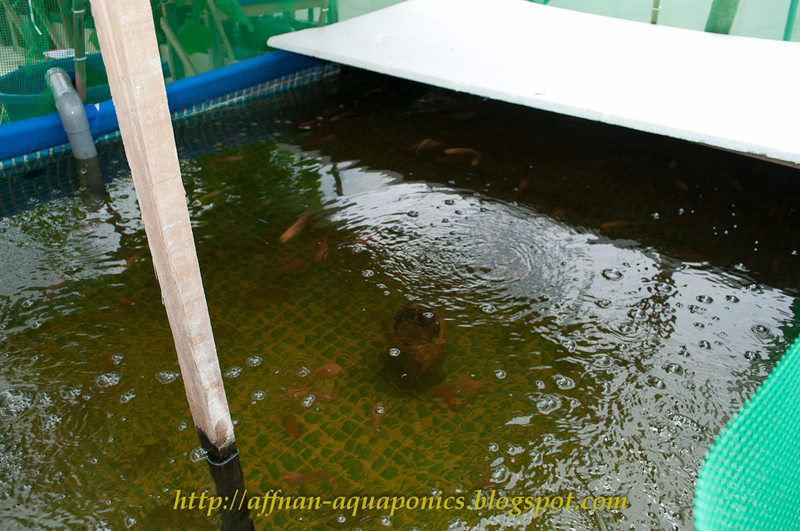 Rows of growbed over fish tank which about 2.5 feet across and about 50 or 60 ft long but its quite shallow around less than 1 ft deep stock with few Tilapia and gold fish. 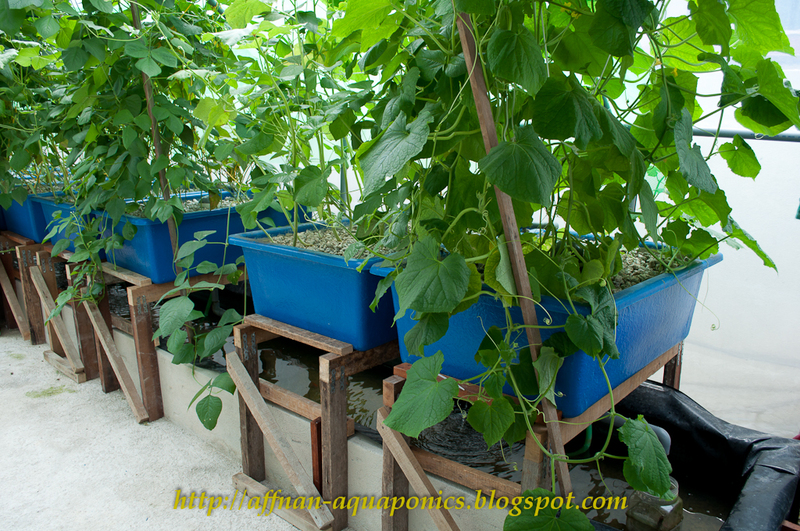 Cucumber, Tomatoes, Beans, Chili and Okra are grown on the flood and drain side. Okra looks a bit thin. Edwin pointed out that these Okra get infested with aphids it stunt their growth. These Tomatoes according to Argustine is about 4 months old. They are having problem with high acidity, PH dropping down, contrary to what I would expect as Limestone gravel used as grow bed it should swing the PH on the opposite side of the scale toward Alkali. Its also affect the DWC system more than the Flood & Drain. 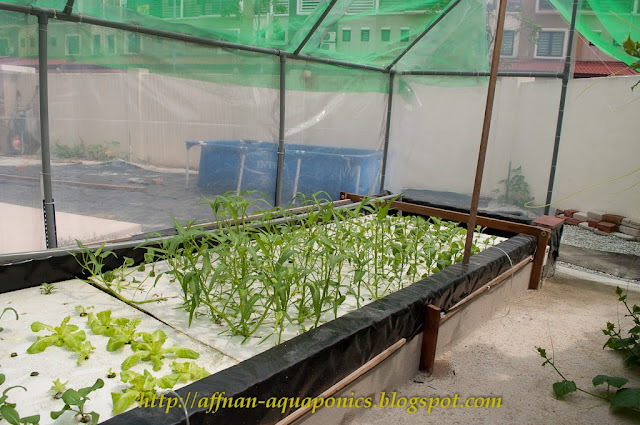 From my short observation, I can't see any thing differ in their Flood and Drain setting to others, also the DWC is of standard installation. Plants are not doing well, one reason I could see is that some plant affected by growbed not fully matured this causes stunted growth, that don't recover after growbed reaches maturity. I'm a bit concerned about the polythene "Green House" it cause the temperature inside to shoot up very high. Its okay for temperate country by over here its can be a killer. 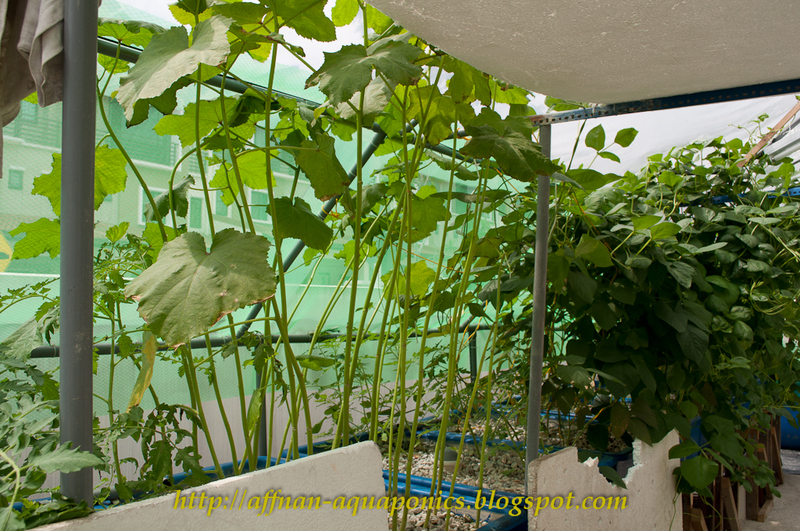 I would suggest green house material are made from those mesh type of nettings that keep away insects but do provide free air flow to not heat up the space underneath. In all they are starting out, and lots of things to learn. I'm sure they'll get it sorted out as they progress. 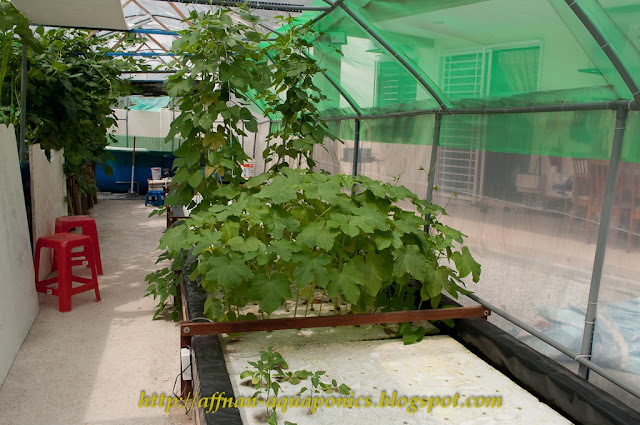 Green house, normally are for temperate countries where temperature can drop below that suitable for plant growth. For Tropics and Equatorial, these houses are more for insect protection or extreme heat, in the case for extreme heat its 50% shade are the norm, and insect condition the insect screen would be suitable. 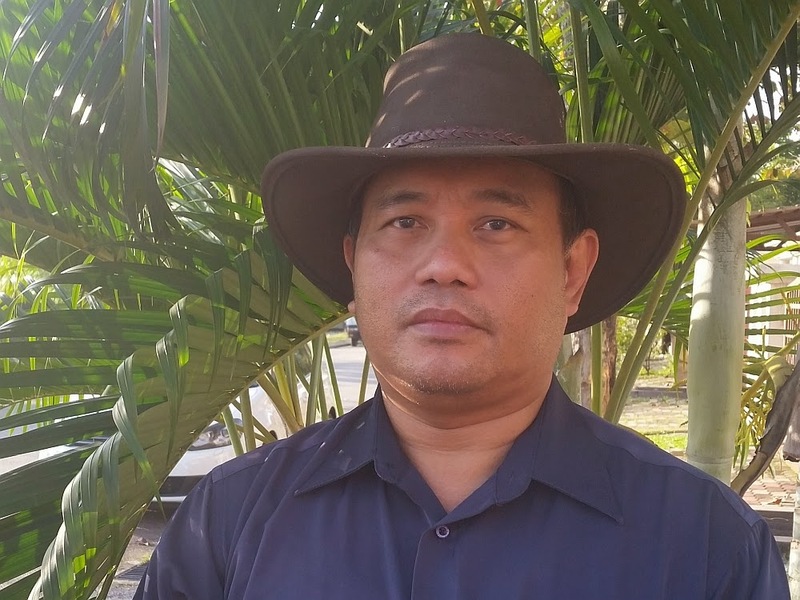 Heavy rain, if its to the extend that would damage those plants then its advisable to have some kind of shelter, like for extreme heat since Philippines do have strong sun most of the time. On those extra water, coming from rain, we do have same situation here where I am located but it don't do much harm in term of diluting nutrient for plants. 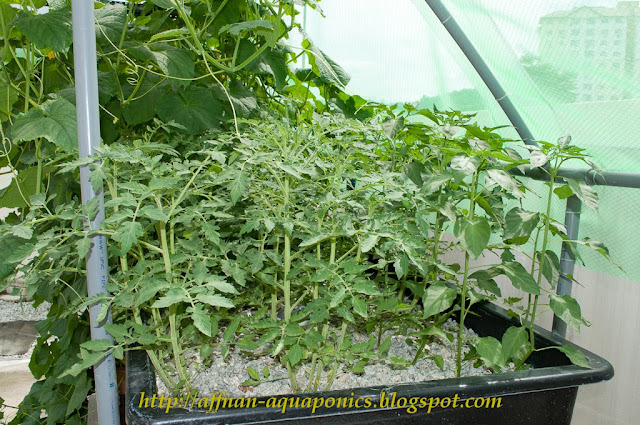 Those Ammonia to Nitrates conversion takes time, and what ever already there in the growbed don't get wash away that much, furthermore since there are still fish in the tank, more Ammonia will be produce. Normally I look forward to rain, since I know I do not need to add any water to my tank and I don't need to worry about Ammonia spike since it will get wash away by overflow water. I would recommend, you could start with basic, and see what the out come and adjust as necessary. This is a safe and normal approach that I would do, however if I have more money at my disposal (which I can never have) I would build a "Green House" for insect protection for my system. What about sunlight?. Should the system has access to 6 or 12 hours sunlight? or it depends on what kind of plants?. TIA. It depend on what kind of plant, in my case the limited sunlight I had will determine what plan I can grow.